If you are traveling eastward through Yosemite’s main hwy, hwy 120, to Mono Lake, along the Tioga Pass you will see a sign of the trail to White Wolf. White Wolf is a camp that is located in an area if you are hiking northwestern Yosemite and Hetch Hetchy Valley. Where and how did the place White Wolf get its name? White Wolf was actually a Yosemite Indian area chief. White Wolf campsite and area was named by the Meyer brothers who had a cattle ranch around Sonora California. When the Meyer brothers were chasing hostile Paiute Indians who stole their cattle, they came upon a group of friendly Paiutes led by a chief named White Chief. So the Meyer brothers gave that place the name White Wolf after that chief. But who was White Wolf? There was a Paiute chief whose band roamed northern Yosemite whose Indian name was Toha’eesha. Toha’eesha in the English language means White Wolf. This chief’s white name was Captain Jim. 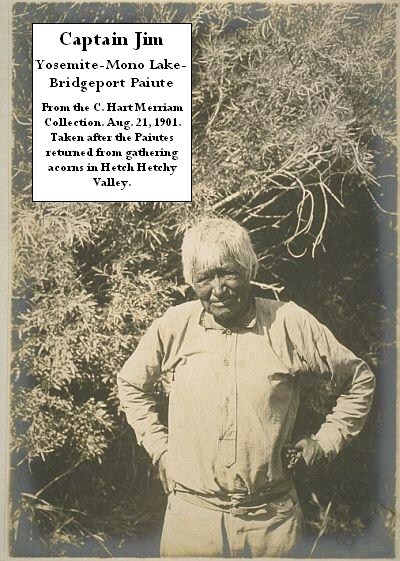 He was a “peace” chief and the leader of the Bridgeport Paiute tribe. Captain Jim was given the name White Wolf because as a young man he was prematurely grey. The wolf was his spirit guide and helper and he reportedly could turn himself into a White Wolf. Unlike some of the other leaders of Paiute bands Captain Jim wanted to live in peace and did not bother the white man. A neighboring Tuolumne/Calaveras Paiute band led by Yankee Jim had been wiped out by white settlers in retaliation after they had stolen from them, and Captain Jim wanted to make sure his people did not meet the same fate. Captain Jim’s sister-in-law had been married into the Yankee Jim band and was one of the survivors. There is a story that we have about the earliest encounter with the white man who came to the Bridgeport area. The white men brought Captain Jim and sub chiefs to a meadow by their village near Twin Lakes and put up targets and shot them from far away hitting the targets. Captain Jim knew then that they could not fight the white man with bows and arrows when they had guns. The white men wanted to show the Paiutes of Bridgeport that they could kill them from a longer distance with ease and Captain Jim got the drift. Not only was Captain Jim the chief named White Wolf, but he was also the father and father-in-law of some of the most famous Yosemite Indian photographic icons and Yosemite basketmakers. 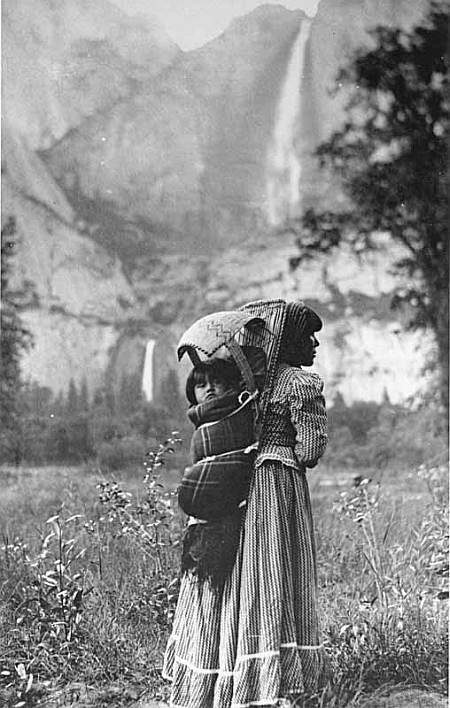 Captain Jim was the father of Tina and Nellie Charlie, whose baskets, which are as big as truck tires, grace the Yosemite Indian Museum. Nellie and Tina Charlie, daughters of Captain Jim. Both sisters have large baskets in the Yosemite Indian Museum. Captain Jim, White Wolf, was the father of Poker Bill. 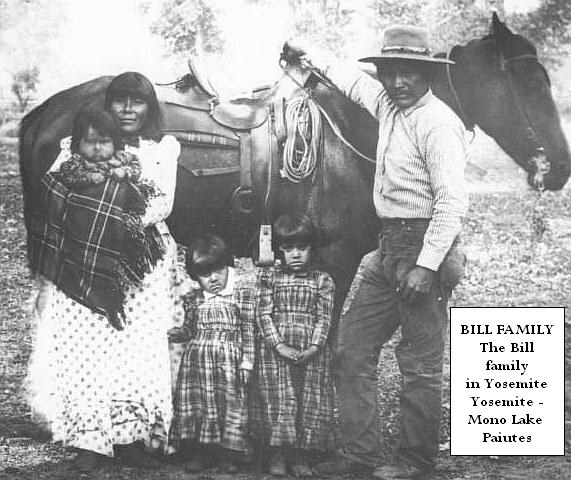 If you receive a Yosemite map at the gate you will see this photo of Poker Bill, son of Captain Jim, with his family. Captain Jim's son Poker Bill and his family, including Carrie and Minnie. 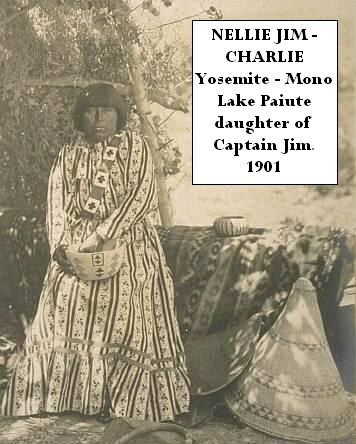 Captain Jim, White Wolf, was the grandfather of Carrie Bethel, another famous Yosemite basketmaker who, like her aunts, Tina and Nellie Charlie, created some of the biggest Yosemite-Mono Lake Paiute baskets located in the Yosemite Indian museum. 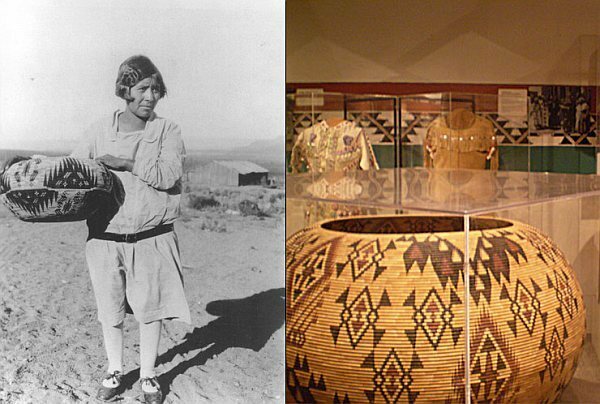 Captain Jim's granddaughter, Carrie Bethel, holding one of her famous baskets and photo of one of Carrie's baskets at the Yosemite Indian Museum. 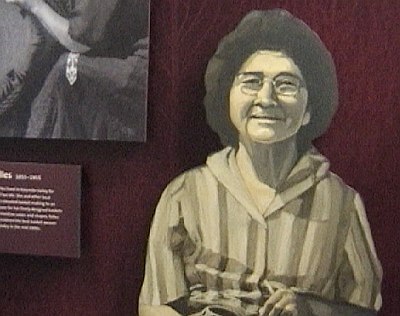 Captain Jim, White Wolf, was the grandfather of Minnie Mike, another famous Yosemite basketmaker and you will see her photo in the Yosemite visitor center. Minnie Mike, Grand daughter of Captain Jim, White Wolf, at Yosemite Visitor Center. Captain Jim, the Mono Paiute chief who the Meyers encountered and gave his Indian name to the famous Yosemite, Hetch Hetchy, Tuolumne camp, White Wolf, chose the path of peace, instead of war. Because Captain Jim, White Wolf, chose peace he and his band lived on and his descendents enriched Yosemite today, and hopefully you who are reading this continue to tell his story. *Not ONE basket in the Yosemite Indian Museum was done by a Miwok,the majority of baskets in the museum were done by Yosemite-Mono Lake Paiutes, but you would not know it because the Park is still peddling the lie of the "Yosemite Miwok"